Founded as a spin-off company of the Karlsruhe Institute of Technology in 2007, today the name Nanoscribe stands for nano- and microfabrication in three dimensions. As market and technology leader, the German company supports science and industry all over the world with high-tech solutions in 3D laser lithography. 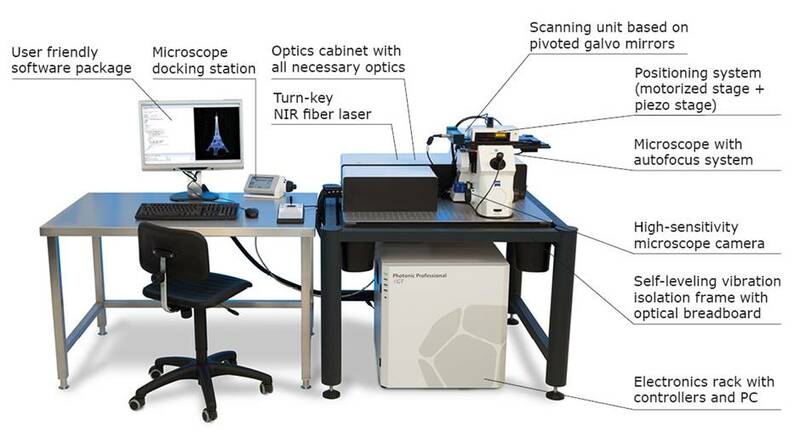 The product portfolio covers both laser lithography systems for 3D micro- and nanostructures based on two photon polymerization as well as specifically designed IP-photoresists. In order to provide a complete solution, Nanoscribe additionally offers know-how in casting of 3D structures, e.g., into metals or semi-conductors. The applications are widely spread e.g. photonics, photonic waveguides and wire bonds, micro-optics, micro-fluidics, biomimetics or scaffolds for cell biology. The next generation 3D laser lithography system, Photonic Professional GT sets new standards in 3D microprinting and maskless lithography. It combines two writing modes in one device: an ultra-precise piezo mode for arbitrary 3D trajectories (FBMS) and the high-speed galvo mode (MBFS) for fastest structuring in a layer-by-layer fashion. In combination with the software package, the system is embedded best along the 3D printing workflow and offers a high degree of automation. In addition, the Photonic Professional GT allows for the fabrication of high-resolution photo masks and other direct write applications. The Photonic Professional GT provides a micro-fabrication platform for research and development in science and industry. It enables the rapid fabrication of micro-sized parts by providing a simple 3D printing workflow to convert virtual 3D models into physical parts with many applications in fields like optics, medicine, fluidics or mechanics. The yet available fabrication processes induce limitations on shape and functional complexity. These bottlenecks for innovation are overcome by the unique design freedom, speed and resolution offered by the 3D printer Photonic Professional GT. Product Name:- EINST Technology awarded distributorship agreement by Nanoscribe Laser Lithography System.